Anita did a great job grooming Sooty, our very nervous long-haired cat. Anita was very gentle and patient with her and managed to comb and cut out bits of matted fur without causing Sooty any discomfort. Throughout the session, Anita was very mindful of Sooty’s temperament and was very gentle with her to minimise any stress that Sooty might have felt. Anita was also very knowledgeable and gave us lots of advice about how we could groom Sooty ourselves going forward, suggesting the right comb to buy and techniques to use on a daily basis. I would wholeheartedly recommend Anita as a top-notch cat groomer. 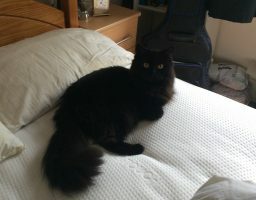 If you have found yourself on this page, are a cat guardian who is looking for a Muswell Hill cat groomer then you have definitely come to the correct place. Why does our Muswell Hill cat groomer stand out? Anita loves cats and understands their behaviours and patterns. She has just finished a work based degree at Middlesex University, focused on her feline behaviour practice. She was awarded a first. Howard and Sooty were happy with their Muswell Hill cat groomer and you and your cat will be too! Anita Kelsey graduated from Middlesex University with a first class Honours degree (work based) in Feline Behaviour and Psychology. She runs a vet referral cat behaviour consultancy in Notting hill, London. Anita also trained in cat grooming at master level and is known for her valuable work with extremely aggressive cats. She is a regular contributor to Your Cat magazine, Cats Protection magazine and The Canine and Feline Behaviour Association of which she is a fully member. Anita is fully recognised, by pet insurance companies and veterinary practices, as an accredited qualified cat behaviour practitioner. Home visit consultations are offered in London and anywhere else in the UK.